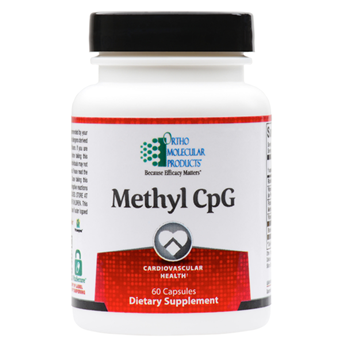 Methyl CpG is a comprehensive formula that includes targeted amounts of five key nutrients designed to support methylation and homocysteine balance in the body. Methylation is a vitamin-requiring biochemical process in the body that is critical for supporting many aspects of mental and physical health including regulating gene expression. Methylation occurs billions of times every second and helps the body to repair DNA on a continual basis. However, when methylation processes in the body slow down, an increase in the breakage of DNA strands can occur. In addition to maintaining DNA repair, methylation reactions help maintain optimal neurotransmitter production, homocysteine balance for cardiovascular health, and the recycling of molecules that are required for detoxification and healthy inflammatory response. Methylation is also required for proper energy metabolism, immune and nerve cell function. Proper methylation can be inhibited by nutrient deficiencies including folate, and B2, B6 and B12. Certain medications such as acetaminophen, aspirin, ibuprofen and oral contraceptives can also deplete blood levels of these crucial B vitamins. Methyl CpG is a comprehensive formula that includes targeted amounts of five key nutrients designed to aggressively support methylation and homocysteine balance in the body. Methyl CpG provides high-concentration folate as Quatrefolic® - 100% 5-MTHF, the biologically active form, and trimethyl glycine. The formula includes key methylation vitamins B2, B6 and B12 (methylcobalamin). This specific blend of methyl donors promotes DNA repair, homocysteine balance, neurotransmitter production, hormone balance and optimal detoxification.